Soca is said to have been created in 1963 by Ras Shorty I's "Clock and Dagger" from calypso music. Shorty added Indian instruments, including the dholak, tabla and dhantal. A prolific musician, composer and innovator, Shorty experimented with fusing calypso and the other Indian inspired music including chutney music for nearly a decade before unleashing "the soul of calypso,"...soca music. Shorty had been in Dominica during an Exile One performance of cadence-lypso, and collaborated with Dominica's 1969 Calypso King, Lord Tokyo and two calypso lyricists, Chris Seraphine and Pat Aaron in the early 1970s, who wrote him some creole lyrics. Soon after Shorty released a song, "Ou Petit", with words like "Ou dee moin ou petit Shorty" (meaning "you told me you are small Shorty"), a combination of calypso, cadence and kwéyòl. Shorty's 1974 Endless Vibrations and Soul of Calypso brought soca to its peak of international fame. Soca Army is dedicated to bringing you the best of Soca Music. We will have videos, pics, and interviews of your favorite Soca artist. 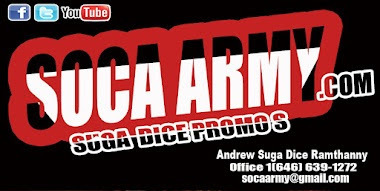 Soca Army website is bought to you by Andrew Sugar Dice Ramdhanny and Sugar Dice Promos. © 2012 Sugar Dice Promos/Music Cleaners. Simple theme. Theme images by sbayram. Powered by Blogger.